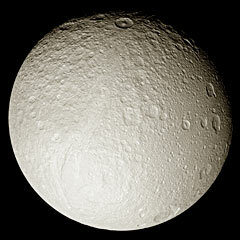 Tethys [TETH-iss] is the ninth of Saturn's known moons and is the fifth largest. It was named after the Greek Titaness who was a sea goddess and both sister and wife of Oceanus. She was the personification of the fertile ocean, and her 3,000 children became the springs, lakes, and rivers of the world. 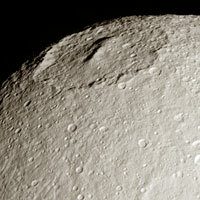 Tethys was discovered by Giovanni Cassini in 1684. Most of what we now know about Tethys was learned during the Voyager missions. 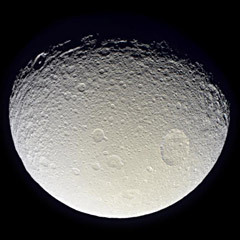 Tethys is believed to be composed almost entirely of water ice. It is one of several such icy worlds in orbit around Saturn, and is very similar to Dione and Rhea in composition. There may be a small amount of rocky material thrown into the mix, making the moon like a "dirty snowball". The moon has a very low density, and this suggests a much larger concentration of ice than rock. This icy surface is heavily cratered. Cracks and faults can also be seen in the ice. The surface temperature on Tethys averages a chilling -305° F (187° C). This Cassini enhanced color image of Tethys shows the full extent of the moon's heavily cratered surface. Tethys is definitely one of the most interesting worlds on our tour, but it does have a few notable surface features. In the western hemisphere can be seen a huge impact crater called Odysseus. 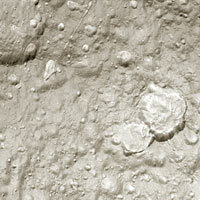 At 248 miles (400 km) in diameter, this crater is nearly 2/5 the size of the entire moon. Astronomers are not quite sure why an impact of this size didn't shatter the moon completely. One theory suggests that Tethys may have been in a semi-liquid state at the time of the impact. Odysseus is a very flat crater that conforms to the shape of the moon itself, but it lacks the ringed mountains and central depression that characterize craters on Earth's moon or Mercury. The other major feature on Tethys is a huge valley called Ithaca Chasma. This canyon is about 60 miles (96 km) wide and 3 miles (4.8 km) deep, and runs 1,242 miles (2,000 km) long. It runs nearly 3/4 of the way around Tethys. These surface features suggest to astronomers that Tethys was not always frozen solid. Some believe that it may have existed in a liquid state at some time in the past. 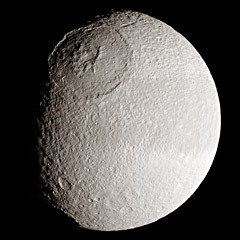 Tethys has several smaller impact craters, which are believed to have formed more recently. 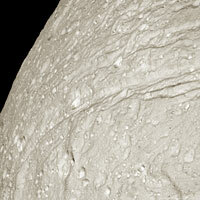 Tethys also contains no albedo features like the ones on Dione and Rhea.